So yesterday was what I consider to be a milestone. I weighed in at 212.6lbs which brings my weight loss total down to 50.4lbs lost since January 5th 2013. So yeah, I feel like bragging lol. Last night we went to a local event where a woman named Erin Davies is driving cross-country to show her documentary called FagBug and talk about her experiences with vandalism and homophobia and to raise awareness on the subject with her car called the “fagbug.” When I heard she was coming, I knew I had to go because I wanted to see the car and have my picture taken with it. And since it would be the first picture of me with 50lbs weight loss, I thought it would work as a great sort of after picture, even though I’m not finished with my journey. Anyway, so let me give you a rundown of the images you see above. Top left was from Christmas 2004. I am actually not positive what my weight was back then, but I’m pretty sure it was 230 give or take. The second picture on the top is a picture that was taken at Hearst Castle in Colorado in 2005. It is also the picture that I used as my author picture since it was the best picture I have ever taken. I hate taking my picture as a fat guy, but love pictures when I’m skinny so perhaps I will be taking a lot more photos when I am finally down in weight. 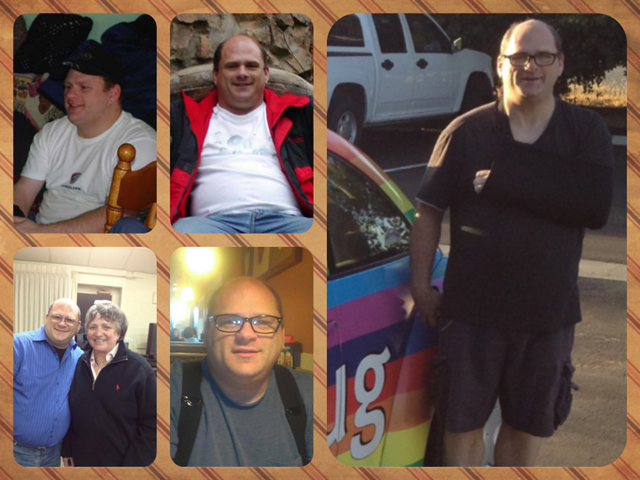 The bottom left picture was taken last year in May at a PFLAG meeting with Robin Tyler. I had no idea until after the picture was taken that my stomach was actually that big. I was beyond mortified, but kept it because I didn’t want to delete the only picture of me with Robin Tyler. I mean, she’s Robin Tyler! The bottom right picture is my before picture. That is the one I took at the IHOP that we went to on New Years Day just before I made the decision to go on this weight loss journey. Finally, the picture on the right is how I look today. You can certainly see the difference in my neck and my face. You probably can’t tell with the black shirt, but believe me, it’s thinner than all those before pictures. My stomach (waist) was 50” and now it is down to 43”. So yeah, it’s thinner. Also my thighs are really skinny now too. I didn’t think to measure my thighs at the beginning or every week because the Noom app didn’t ask me to, but that doesn’t mean I shouldn’t have still kept a record. It doesn’t matter because they are thinner now. Oh and thank you photographer (my partner) for taking the picture with me talking instead of smiling lol. That was sarcasm of course. My total weight loss since January 5th is 50.4lbs. My goal is to lose 63lbs, so I only have 12.6lbs to go. Although, once I meet my goal I will adjust the Noom app so that I will go down to 170 because 63lbs was just a small goal to get me started, my true goal is much higher than a measly 63lbs. I was afraid that if I set too high of a goal, I wouldn’t have been able to do it. I think that I have proven to myself that not only can I meet this goal, but I can keep going until all the fat is gone.